The benefits of quitting smoking occur almost immediately. Within 6-12 hours of quitting smoking: Nearly all traces of nicotine in your bloodstream have been processed and expelled by your body. Your blood oxygen level has increased to normal and your carbon monoxide levels have dropped to normal. 48 hours after quitting smoking: The nerve endings responsible for taste and smell begin to heal, after smoking has damaged them, leading to a heightened sense of smell and a vivid experience of taste. 3 days after you stop smoking: Breathing will become easier because your lung bronchial tubes, leading to air sacs, have begun to relax. In addition, your lungs will be able to clean themselves more effectively. 7 days after you stop smoking: Your sense of smell and taste begins to improve. 2 months after you stop smoking: Insulin resistance has normalized, circulation has improved and there is a reduction in coughing and wheezing. 12 months after you stop smoking: Your risk of getting cancer continues to decrease. Risk of coronary disease is halved. Lung functionality becomes normalised. The health benefits of quitting smoking timeline continues going forward. From a lowered risk of stroke to a decrease in the likelihood of lung, mouth, throat and pancreatic cancer, when you use our 4-step quitting process, you give your body the ultimate gift. There are many reasons to quit smoking. Are you sick of wasting your money on nicotine patches and other medication that simply don’t work? Are you worried that your smoking habit will cost you valuable time with your friends and family in the future? The benefits of quitting smoking are lengthy and cover physical, emotional and financial success that comes to you when you quit. 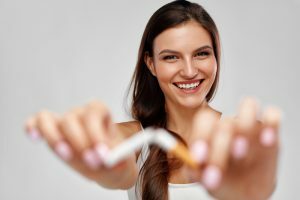 In fact, the health benefits of quitting smoking begin the day you stop smoking and continue over time, healing your body and reducing your chances of coronary disease and cancer substantially. With our 95.6% success rate, let this time be the time you squash that smoking habit for good! Our quit smoking hypnotherapy treatment has made it easy to finally put an end to your habit. We offer a quick and easy treatment, in just 60 minutes you can be free of cigarettes for life. It’s a simple and hassle free experience which doesn’t require you to make any major changes to your life in order to quit smoking, if you have the desire to quit, then you can. It’s as simple as that. So take the life changing step that will grant you a better quality of life. Our process guarantees you results, so if you don’t quit smoking in 60 minutes, we’ll work with you for free until you do. You’ve never had more reasons to quit smoking, so call us now at 1300 64 53 54 or contact us to start your transformation.